The Porsche 911. Our identity. A truly distinctive design. Technology that was born on the race track. Emotional impact that has been standard since 1963. Yet, is that enough to move forward? Don’t we need to break the stranglehold of tradition once in a while before it one day brings us to a complete standstill? We believe that the answer is ‘yes’, which is why no fewer than 90% of the components of the Porsche 911 are either new or have been fundamentally revised. This is our approach to the preservation of tradition and it is precisely how we do justice to the Porsche 911 legend. Every child recognises a Porsche 911, but can its identity be described in words‘? It can, by looking more closely at the use of form, proportions and contours. The wings are higher than the bonnet which give the new Porsche 911 its distinctive expression and leave you in no doubt as to its temperament. The modified vehicle architecture, with a wider track at the front axle and the lower roof line, gives the front of the new Porsche 911 a dynamic appearance that is sporty and elegant. For improved aerodynamics, the exterior mirrors are now mounted directly on to the doors. In summary, form always follows function. As a design principle, it couldn’t be more simple, but it’s what makes the 911 a Porsche 911. It’s also how we have managed to achieve a very low drag coefficient of just 0.29. Fitted as standard, the new Eli-Xenon headlights still have the familiar oval shaped surrounds. Adding to the car’s classic appeal, they also offer a glimpse of the technically impressive inner workings. The direction indicators, daytime running lights and position lights all feature LED technology and are integrated into the separate front light units. Their slimline design contrasts with that of the rounded headlights. Together with the two integral air intakes, they give the front of the new 911 its unmistakable look. The stainless steel tailpipes have been restyled for both models. 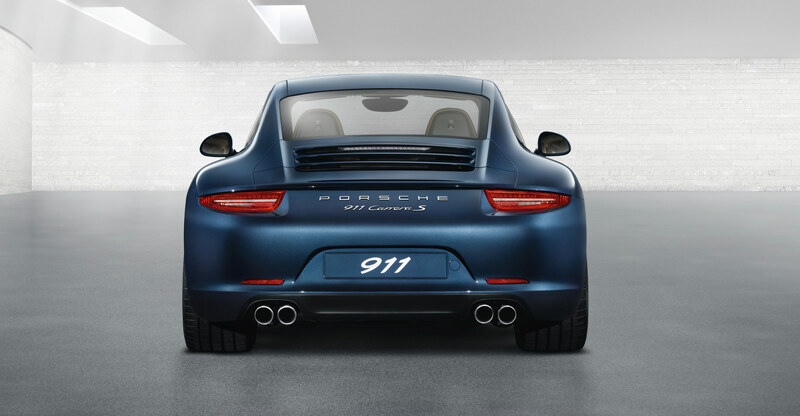 On the new Porsche 911 Carrera S, twin tailpipes are fitted on both sides. One new feature is the wider, extendable rear spoiler, which reduces lift in all driving situations and increases driving stability. Even the logo on the rear has an important function to perform. It is, after all, the hallmark of the Porsche identity. At the rear, everything feels sharper: the styling, the appearance and the overall effect. This is due not least to the pronounced profile edge and new LED taillights, their stretched design accentuating the horizontal contouring of the rear. The characteristic reflector units are positioned much lower – for a highly distinctive rear design, particularly at night. On the new 911, the wheels have been enlarged by one inch over the previous model. Not only do the larger wheels improve dynamic performance, they also look more imposing. 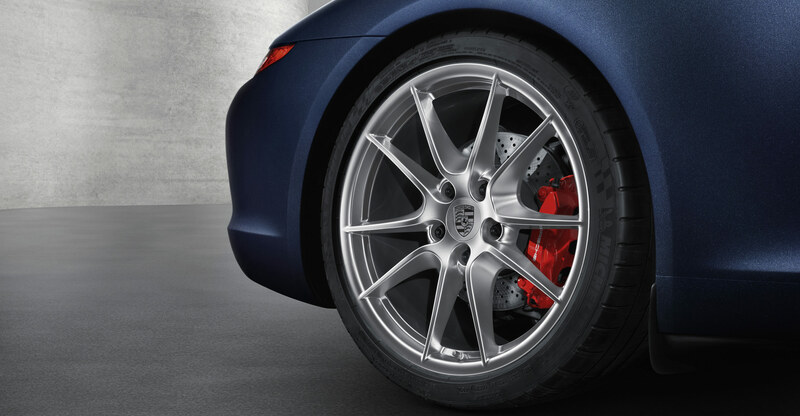 The new 911 Porsche Carrera is equipped with 19-inch Carrera wheels as standard. These are lightweight alloys featuring a classic sporty design. Tyre sizes are 235140 ZR 19 and 235135 ZR 19 at the front and rear respectively. 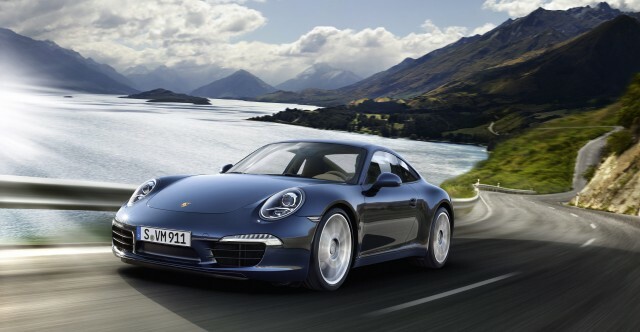 The New Porsche 911 Carrera S model is equipped with light-alloy 20-inch Carrera S wheels as standard. The visual effect is sporty and dynamic. The tyres are slightly wider to cope with the increased power output of this model: 245135 ZR 20 at the front, 295130 ZR 20 at the rear. The larger tyre size improves both ride comfort and track performance. The rolling resistance of the summer tyres has been reduced by up to 7% to improve fuel economy, while tyre weight and dry braking distances have also been reduced. A selection of 20-inch wheels is available in our range of options. The future of the sports car. In the new Porsche 911, the future has already begun. The highly efficient, state-of-the-art engines make a considerable contribution to reducing fuel consumption, but their sound is still unmistakably Porsche. Fuel consumption* new Porsche 911 Carrera: Extra urban: 6.8 l/100 km (41.5 mpg}; Urban: 12.8 l/100 km (22.1 mpg}; Combined: 9.0 l/100 km (31.4 mpg}; Emissions: 212 g/km. Tradition and innovation combine seamlessly in the new rear-mounted 3.4-litre flat-six engine thanks to its downsized capacity. Despite the reduced displacement, the engine is capable of delivering eyen more power to the road than its 3.6-litre predecessor. The figures speak for themselves: 25? 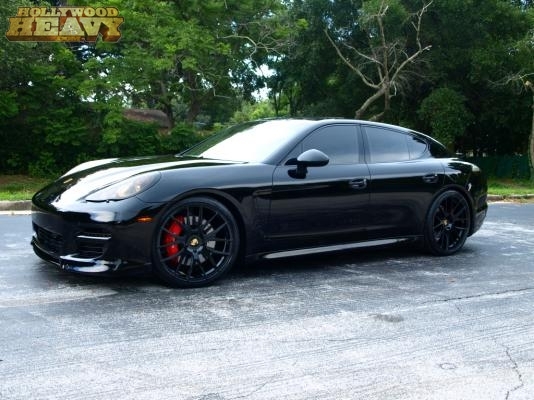 kW (350 hp) at 7,400 rpm. Maximum torque: 390 Nm at 5,600 rpm. 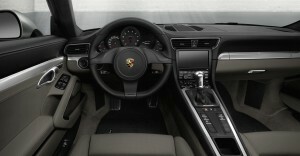 Yet, in conjunction with Porsche Doppelkupplung (PDK), both fuel consumption and CO2 emissions have been reduced by 16%. Eyen more impressively, the car accelerates from 0 to 100 km/h (62 mph) in 4.8 seconds and reaches a top speed of 239 km/h (130 mph). The power of the new Porsche 911 Carrera is transmitted precisely and directly to the wheels by the new 7-speed manual gearbox. The SPORT button, which is fitted as standard, makes it possible to select an eyen more responsive engine and transmission setup. Fuel consumption* new Porsche 911 Carrera S: Extra urban: 7.1 l/100 km (39.8 mpg); Urban: 13.8 l/100 km (20.6 mpg); Combined: 9.6 l/100 km (29.7 mpg); Emissions: 224 g/km. at 5,600 rpm. With a manual gearbox, the sprint from 0 to 100 km/h (62 mph) is completed in just 4.5 seconds, all the way up to a top speed of 304 km/h (189 mph). All this power is matched with outstanding efficiency. Fuel consumption and CO2 emissions have been reduced by 14% compared with the previous model. 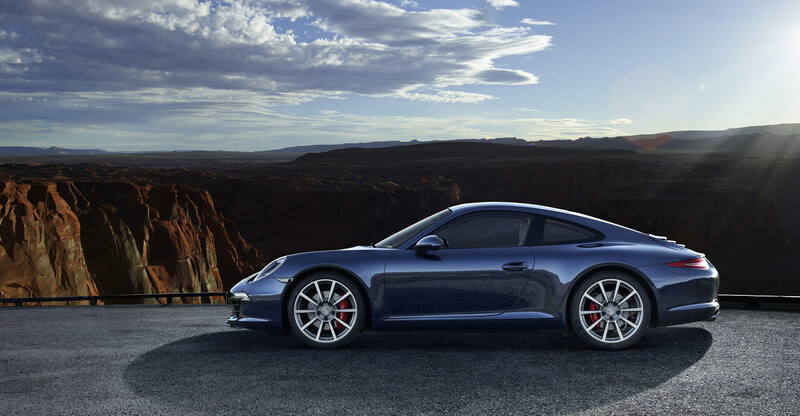 The Porsche 911 Carrera S also displays its rich racing heritage both visibly and audibly: with the resonant sound from its engine, twin tailpipes in brushed stainless steel and 20-inch Carrera S wheels. * Consumption figures were obtained on the basis of standard equipment. Special equipment may affect consumption and performance. 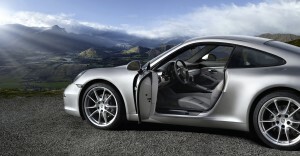 The latest Porsche models are designed to operate on fuels with an ethanol content of up to 10%. Data determined for standard specification and in the NEDC (New European Driving Cycle) in accordance with the Euro 5 (715/2007/EC and 692/2008/EC) measurement method. The figures do not refer to an individual vehicle nor do they constitute part of the offer. They are intended solely as a means of comparing different types of vehicle. You can obtain further information about individual vehicles from your Porsche Centre. 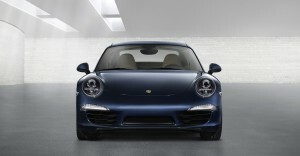 the new Porsche 911 look even more compact. The redesigned independent suspension at the front features a lightweight spring-strut axle with longitudinal and transverse links and cross members that have been refined for stiffness. Each front wheel is precisely located, ensuring excellent directional stability, superior handling and increased anti-dive (reduced pitching under braking), and the wider track optimizes turn-in. The rear axle is equipped with a motorsport-derived multi-link suspension and chassis sub frame based on the LSA concept (Lightweight, Stable, Agile), which that has been modified to offer improved noise characteristics. Refined axle kinematics for improved longitudinal damping reduce acceleration squat and increase comfort. Lightweight spring struts further enhance agility. The high proportion of aluminium used in the construction of the axles reduces the weight of the vehicle and of the unsprung masses, helping to improve fuel economy, comfort and agility. center console. Its intelligent operating concept follows a clear principle of direct simplicity. Also new is the optional light design package for the footwells, storage compartments, rear compartment and overhead console. 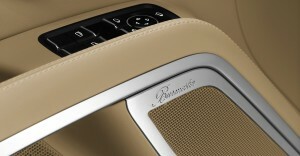 As ever, we offer an extensive selection of interior colours and materials, such as carbon, leather, wood or aluminium. The new Porsche 911 proves that apparent opposites, such as style and engineering or comfort and performance, can go hand in hand. A classic 911 feature is the arrangement of the five round instruments with the rev counter in the middle, while further new additions include the instrument cluster with a high-resolution 4.6-inch full “-/GA TFT colour display for viewing on-board computer, audio system or navigation information. 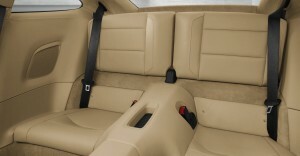 The sports seats in full leather are comfortable and provide excellent support even during performance driving. They are equipped as standard with electric seat height and backrest adjustment and manual fore/aft adjustment. Available as an option are Sports seats Plus in leather with electric seat height and backrest adjustment as well as manual fore/aft adjustment. They also feature more contoured side bolsters for even better lateral support. The optional fully electric Sports seats offer adjustment of seat height, squab and backrest angle, squab length, fore/aft position and 4-wav lumbar support. The steering column is also electrically adjustable. The optional adaptive Sports seats Plus provide the ideal combination of sport and comfort. Finished in leather, the seats feature side bolsters with a firm, sporty padding, as well as shoulder supports for the best possible hold. Offering 18-way electric adjustment, the seats can be optimally adapted to meet your needs in terms of seat height, squab and backrest angle, squab length, fore/aft adjustment and 4-way lumbar support. The steering column is also electrically adjustable. In addition, the side bolsters on the seat squab and backrest are independently adjustable for added comfort on long journeys and precision lateral support on winding roads. Seat heating is available as an option for all seat variants. This includes the squab, the backrest and, for the front seats, the side bolsters. In conjunction with seat heating, seat ventilation can also be provided on request. The rear seats are remarkably comfortable for a sports car and the shelf behind offers additional storage space. The backrests fold as standard to offer a generous 205 liters of luggage space in the rear. 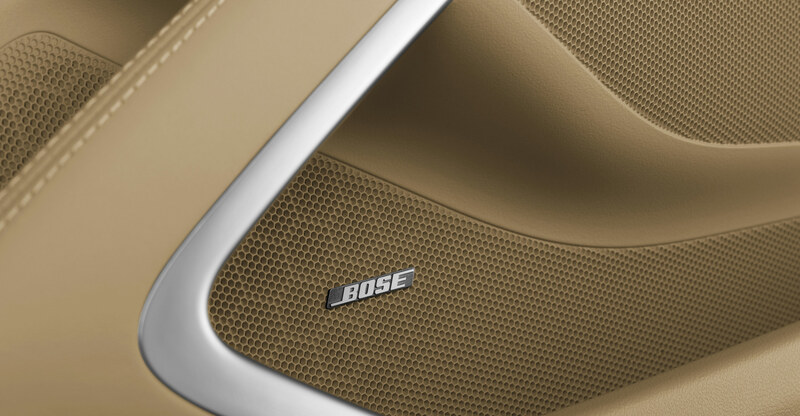 The optional BOSE® Surround Sound System was specially developed for the Porsche 911 and is therefore perfectly tuned to the car’s specific interior acoustics. It has a total output of 445 watts and comprises 8 amplifier channels, 12 loudspeakers including a 200-watt active subwoofer. The combined effect is a balanced acoustic pattern that transforms your new Porsche 911 into a concert hall. The BOSE®-patented AudioPilot® noise compensation technology uses a microphone to continuously monitor the ambient noise inside the vehicle and adapts music playback instantly and automatically. of 35 Hz to 20 kHz. The special ribbon-based tweeters and perfectly matched loudspeaker housings contribute to a natural and richly textured spatial sound never before experienced in a Porsche 911. The pure, sporty design with galvanized surrounds and Burmester® logos on selected loudspeakers makes it clear that the appeal of the Burmester® High-End Surround Sound System is as much about the visual as it is the audio. Typically Porsche. Porsche identity on the inside, as demonstrated by the new elevated center console. In typical Porsche fashion, the use of form follows a basic principle: focus on the driver. This is why the distance between the gear lever or selector and steering wheel is extremely short and the operating logic, such as that of the 2 zone air conditioning system or the suspension settings, is clear and uncomplicated. You shouldn’t have to browse one submenu after another. You should in-stead be able to concentrate on what’s important: the road. 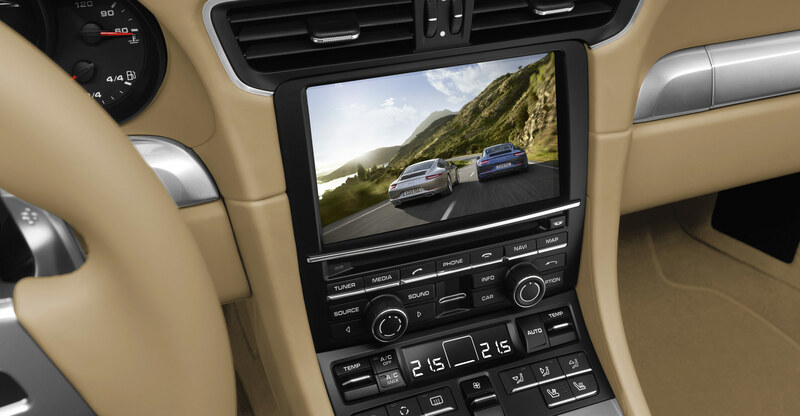 Both 911 models feature 2-zone automatic climate control as standard with an enhanced ventilation effect and separate temperature controls for the driver and front passenger. The available air conditioning modes are gentle, normal and strong. An active carbon filter traps particles, pollen and odours and an automatic air-recirculation function permanently monitors air quality, reduces humidity and switches from fresh to recirculated air when required. A demister function keeps the windows clear in cold weather. In warmer weather, a solar sensor helps the climate control to detect strong sunlight and automatically compensate for the comfort of both the driver and front passenger. The optional electrically adjustable slide/tilt sunroof is a completely new design. It opens outwards so that it does not interfere with headroom. Another advantage of the new design is the much larger aperture for increased driving pleasure under the open sky. The newly developed two-position net-type wind deflector protects against draught and minimizes wind noise. Eyen humming disturbances are eliminated, whatever your speed of travel. The optional ParkAssist features 4 inconspicuous sensors in the rear end. The system audibly alerts the driver to the presence of obstacles detected behind the vehicle. An intermittent warning tone increases in rapiditv as the obstacle is approached. An enhanced version of ParkAssist, with 4 sensors in the front end, is available on request. The audible alert is supplemented by a visual warning in the central display screen, which shows a graphical representation of the vehicle from overhead. Discover the new Porsche 911 in Porsche web special.